Last Saturday, while the university was holding its Poly Cultural weekend, a member of Lambda Chi Alpha was photographed at a fraternity brotherhood event. 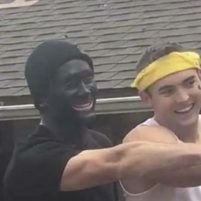 The blackface photo, coupled with a second photo showing fraternity members dressed as gangsters, have caused outrage in the local community. After earlier punitive and public relations measures failed to quell the anger, on Thursday, Cal Poly President Jeffrey Armstrong held a forum on the blackface incident at the university Performing Arts Center. Nearly 1,000 students attended the forum. During the event, Armstrong announced that Cal Poly’s Interfraternity Council had decided to put all of the university’s fraternities on suspension. The fraternities, which are describing the suspension as a voluntary measure, are now prohibited from partaking in many of their usual activities. Armstrong, who said he was horrified by the blackface photo, said university officials are still investigating both Lambda Chi Alpha and the fraternity member who appeared in blackface. The university president said it is doubtful the student will be expelled from Cal Poly. Nonetheless, students who spoke during the forum called for the student’s expulsion, as well as stiffer sanctions against other Lambda Chi Alpha members. Students also said they feel unsafe on campus and asked Armstrong what resources the university would provide to students of color. Denise Isom, the chair of Cal Poly’s Ethnic Studies Department and executive with the Office of University Diversity and Inclusion, flanked Armstrong during the forum. “We have been trying all week to create a safe space, to create meaningful dialogue,” Isom said. Prior to Thursday’s forum, the Mustang News published an editorial headlined “Dear President Armstrong, you have failed.” The editorial was written by Naba Ahmed, Mustang News’s editor-in-chief. Ahmed stated she is a Muslim woman of color and that she was horrified by the Lambda Chi Alpha incident. The Tribune republished the editorial, despite it containing questionable comments on journalistic ethics. In both the Mustang News and Tribune versions, the editorial contains a note stating Ahmed’s views “do not reflect the viewpoints and editorial coverage of Mustang News.” Both versions note Ahmed is the editor-in-chief of Mustang News. The blackface scandal has already garnered national news coverage, including from the New York Times. The New York Times article recapped multiple “racist or insensitive incidents” at Cal Poly in recent years. I love how rich white men are offended by this. Armstrong thinks it’s the worst thing ever to happen at cal poly, ranking just ahead of countless rapes and Kristen Smart’s murder. I’ve got a great idea, before you anyone into Cal Poly give them a test. Tell 10 of the most racist jokes you can find and if they even smirk, “sorry, you’re out!”, try Cuesta. I effin can’t stand millennials…the most angst-ridden, overly sensitive, pu**ified generation this planet has ever seen, courtesy of leftist schoolteachers, Marxist professors and wussy parents. This country is doomed if and when these milquetoasts ever get their hands on the levers of power. And the Dust-up of the Day Award goes to…. “Cal Poly and the kid painting his face black”…. Armstrong said he was horrified? ( Dictionary for the meaning of horrified-fill with fear, frighten the living daylights out of, make someone’s hair stand on end, make someone’s blood run cold). He needs to come out and see what is going on in the real world. If he is horrified by this you have to wonder if this is the person who should be in charge of a major college? I certainly hope that something serious never happens there because it sounds like there is a better chance of this guy melting down before Diablo. But I guess we shouldn’t forget about the politics involved either.